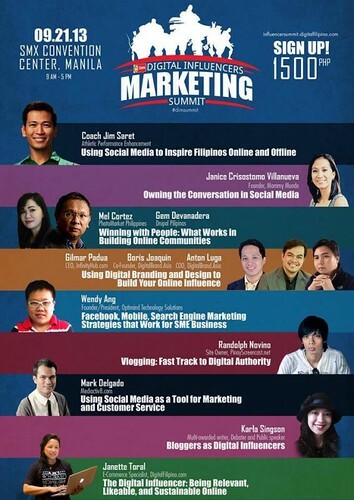 Mommy Mundo and Mompreneur Manila founder, Janice Villanueva will speak at the upcoming Digital Influencers Marketing Summit happening this September 21, 2013, Saturday at the SMX Convention Center, Manila. Her topic is on “Owning the Conversation in Social Media”. The event is an all day-conference packed with talks from speakers of different fields of expertise. From its website:The 2nd Digital Influencers Marketing Summit Manila #dimsummit aims to empower entrepreneurs, marketers, and advertisers with insights on working with influencers and brand advocates. It is also an ideal conference for those who are aspiring to become influencers and recognized brand advocates. Fee is P 1,500 per person inclusive of lunch, conference shirt (while supplies last) and a conference kit. Sign up at http://influencersummit.digitalfilipino.com/ Online registration will close on September 18.